1. 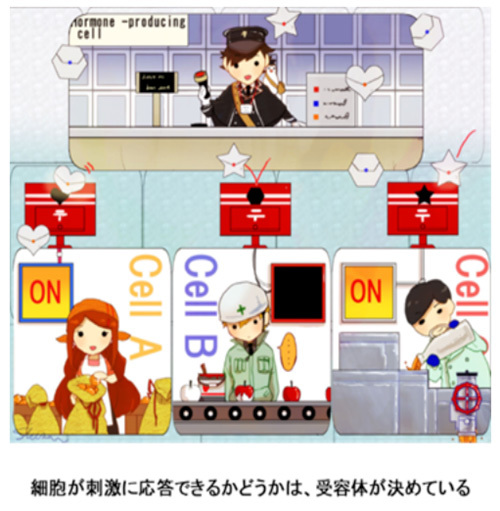 Mochimaru Y, Azuma M, Oshima N, Ichijo Y, Satou K, Matsuda K, Asaoka Y, Nishina H, Nakakura T, Mogi C, Sato K, Okajima F, Tomura H. Extracellular acidification activates ovarian cancer G-protein-coupled receptor 1 and GPR4 homologs of zebra fish. Biochem Biophys Res Commun 2015; 457: 493-499. 2. Tobo A, Tobo M, Nakakura T, Ebara M, Tomura H, Mogi C, Im DS, Murata N, Kuwabara A, Ito S, Fukuda H, Arisawa M, Shuto S, Nakaya M, Kurose H, Sato K, Okajima F. Characterization of imidazopyridine compounds as negative allosteric modulators of proton-sensing GPR4 in extracellular acidification-induced responses. PLoS One 2015; 10: e0129334. 3. Ichijo Y, Mochimaru Y, Azuma M, Satou K, Negishi J, Nakakura T, Oshima N, Mogi C, Sato K, Matsuda K, Okajima F, Tomura H. Two zebrafish G2A homologs activate multiple intracellular signaling pathways in acidic environment. Biochem Biophys Res Commun 2016; 469: 81-86. 4. 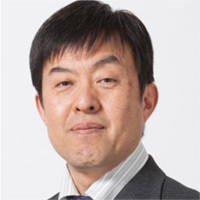 Negishi J, Omori Y, Shindo M, Takanashi H, Musha S, Nagayama S, Hirayama J, Nishina H, T. N, Mogi C, Sato K, Okajima F, Mochimaru Y, Tomura H. Manganese and cobalt activate zebrafish ovarian cancer G-protein-coupled receptor 1 but not GPR4. J Recept Signal Transduct Res 2017; 37: 401-408. 5. Satou K, Mochimaru Y, Nakakura T, Kusada T, Negishi J, Musha S, Yoshimura N, Kato Y, Tomura H. Easy detection of hormone secretion from LbetaT2 cells by using Gaussia luciferase. J Reprod Dev 2017; 63: 199-204. 6. Mochimaru Y, Negishi J, Murakami S, Musha S, Sato K, Okajima F, Tomura H.　Metals Differentially Activate Ovarian Cancer G Protein-Coupled Receptor 1 in Various Species. Zoolog Sci. 2018; 35:109-114. 1. 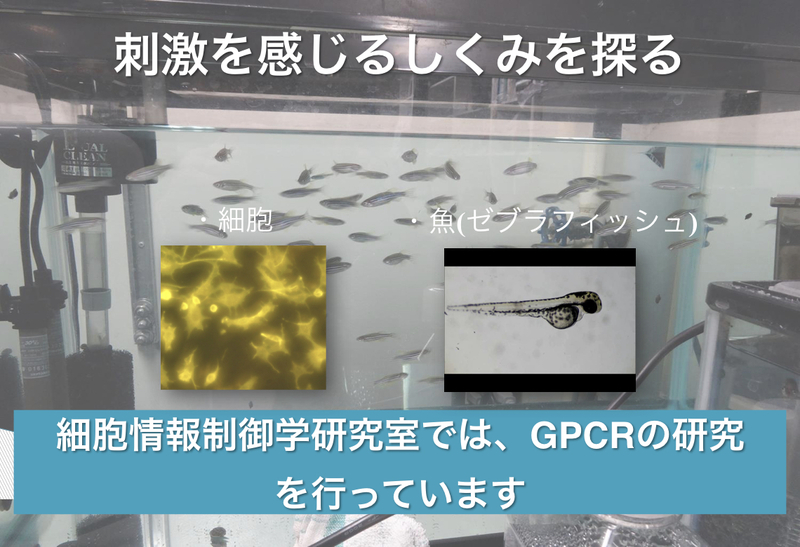 Mochimaru Y, Oshima N, Nakakura T, Mogi C, Sato K, Okajima F, Tomura H. Characterization of OGR1 and GPR4 homologues in zebrafish genome. The 39th JSCE and 8th ISAREN合同大会, 岡崎カンファレンスセンター, 2014.11.7-9. 2. Mochimaru Y, Satou K, Shindo M, Kato Y, Tomura H. Analysis of LβT2 cell responses through ovarian cancer G-protein coupled receptor 1. CompBiol 2015広島大会, 広島・JMSアステールプラザ, 2015.12.11-13. 3. Negishi J, Omori Y, Takanashi H, Kusada T, Tomura H. Metals activate ovarian cancer G-protein-coupled receptor 1 of zebrafish. CompBiol 2015広島大会, 広島・JMSアステールプラザ, 2015.12.11-13. 4. Mochimaru Y, Azuma M, Negishi J, Tomura H. Proton activates OGR1, GPR4 and G2A homologs of zebrafish. International Society for Stem Cell Research (ISSCR2016), San Francisco, 2016.6.22-25. 5. Mochimaru Y, Azuma M, Negishi J, Tomura H. Proton activates OGR1, GPR4 and G2A homologs of zebrafish. International Symposium on Pituitary Gland and Related Systems (ISPGRS 2016), Honolulu, Hawaii, 2016.9.1-5. 6. 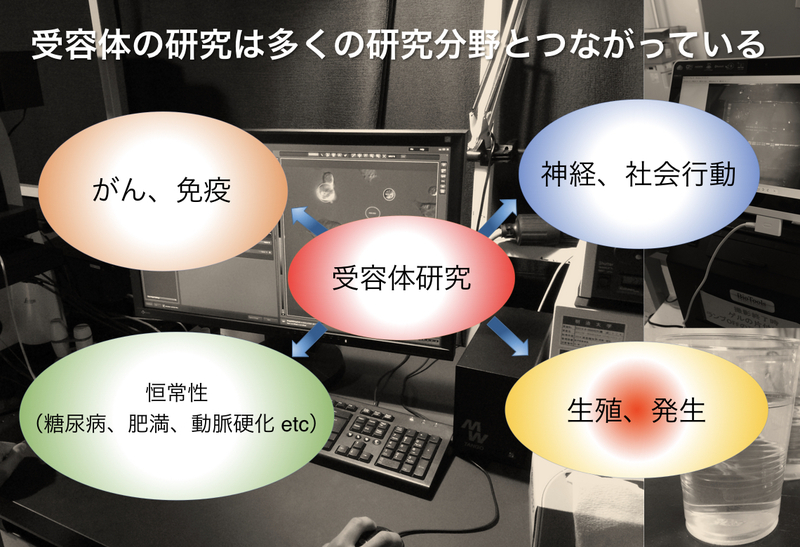 Negishi J, Omori Y, Nagayama S, Tomura H. Effect of metal ions on the activation of zebrafish ovarian cancer G-protein-coupled receptor 1. International Symposium on Pituitary Gland and Related Systems (ISPGRS 2016), Honolulu, Hawaii, 2016.9.1-5. 7. 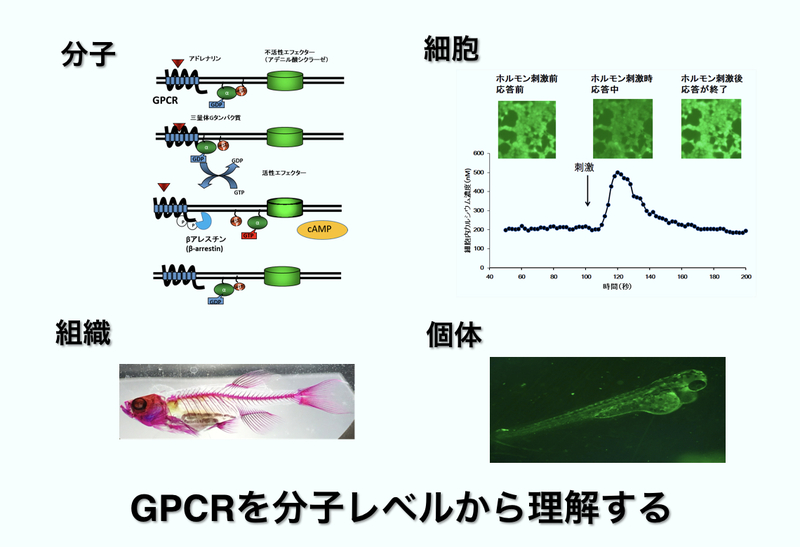 Negishi J, Musha S, Nagayama S, Tomura H. Effect of metals on the activation of zebrafish ovarian cancer G-protein-coupled receptor 1 and GPR4. The 4th World Congress of Reproductive Biology 2017 (WCRB 2017), Okinawa Convention Center, Okinawa, 2017.9.27-29. 8. Mochimaru Y, Murakami S, Yoshimura N, Tomura H. Metal ions may modulate proton induced OGR1 activation. The 4th World Congress of Reproductive Biology 2017 (WCRB 2017), Okinawa Convention Center, Okinawa, 2017.9.27-29. 1. 佐藤一裕, 一條裕太, 高橋邑和, 立石裕貴, 草田智之, 根岸潤, 佐藤聡恵, 加藤幸雄, 戸村秀明. LβT2細胞におけるGnRHに対するシグナル活性化様式の解析. 第29回日本下垂体研究会学術集会, 八王子セミナーハウス, 2014.8.8-10. 2. 小金井健登, 持丸雄太, 大嶋菜月, 戸村秀明.ゼブラフィッシュOGR1ファミリーのシグナリング解析. 第29回日本下垂体研究会, 八王子セミナーハウス, 2014.8.8-10. 3. 佐藤一裕, 加藤幸雄, 戸村秀明. LβT2細胞におけるGnRHに対するシグナル活性化パターンの解析. 第107回日本繁殖生物学会, 帯広畜産大学, 2014.8.20-23. 4. 一條祐太, 戸村秀明. ゼブラフィッシュG2Aの機能解析. 第87回日本生化学会大会, 京都国際会議場, 2014.10.15-17. 5. 佐藤一裕, 加藤幸雄, 戸村秀明. LβT2細胞における性腺刺激ホルモン放出ホルモンに対するシグナル応答解析. 第87回日本生化学会大会, 京都国際会議場, 2014.10.15-17. 6. 大嶋菜月, 持丸雄太, 戸村秀明. ゼブラフィッシュGPR4, OGR1の分子的特徴. 第87回日本生化学会大会, 京都国際会議場, 2014.10.15-17. 9. 佐藤一裕, 根岸潤, 中倉敬, 草田智之, 加藤幸雄, 戸村秀明. ガウシアルシフェラーゼを利用した高感度ホルモン分泌アッセイ系の構築の試み. 第108回日本繁殖生物学会, 宮崎大学, 2015.9.17-20. 10. 持丸雄太, 新堂真実, 西田真実, 金子諒, 加藤幸雄, 戸村秀明. プロトン刺激による性腺刺激ホルモン産生細胞株の応答解析. 第108回日本繁殖生物学会, 宮崎大学, 2015.9.17-20. 11. 持丸雄太, 根岸潤, 大森由花, 高梨颯, 武者詩織, 戸村秀明. 生物種間における金属イオンによるOGR1活性化の比較. 第109回日本繁殖生物学会大会, 相模原･麻布大学, 2016.9.11-15. 12. 高梨颯, 根岸潤, 大森由花, 武者詩織, 永山純礼, 戸村秀明. ゼブラフィッシュOGR1は金属イオンにより活性化される. 第39回日本分子生物学会年会, 横浜パシフィコ横浜, 2016.11.30-12-2. 17. 武者詩織、根岸潤、永山純礼、持丸雄太、戸村秀明 金属イオンによるOGR1, GPR4を介した応答解析 2017年度生命科学系学会合同年次大会（ConBio2017）, 神戸ポートアイランド, 2017.12.6-9. 18. 村上奨、持丸雄太、東野瑚子、吉村名央、戸村秀明 金属イオンによるOGR1活性化の差を生む部位の探索 2017年度生命科学系学会合同年次大会（ConBio2017）, 神戸ポートアイランド, 2017.12.6-9.